The stainless plate flange is second most used joining method after welding. Stainless flat flanges are used when joints need dismantling. The stainless flat flanges provide flexibility for maintenance. The stainless plate flange connects the pipe with various equipment and valves. Stainless flat flanges are added in low pressure pipeline systems if regular maintenance in required during plant operation. Stainless flat flanges are most widely used in fuel and water pipelines, where two flange plates are bolted together with a gasket in between them. The stainless flange plate has bolt holes all around the perimeter and is used to create junctions, tees and joints. Stainless plate flanges EN1092-1, PN6 Plain flange looks like a flat circular disk with inner bore and bolt holes on it.It is one kind of the slip on flange. 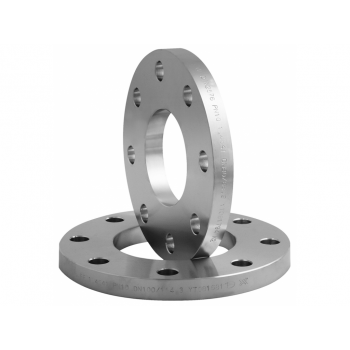 Stainless Flat flanges are used in pipework systems for connecting and attaching pipes, valves, pumps, and so on. As an external or internal ridge, or rim, flanges are usually designed.. Stainless plate flanges EN1092-1, type 01, PN10 The Flat Face flange has a gasket surface in the same plane as the bolting circle face. Applications using flat face flanges are frequently those in which the mating flange or flanged fitting is made from a casting. Plain flange looks like a flat circular disk with inner bore and bolt holes on .. Stainless plate flanges EN1092-1, type 01, PN16 The Flat Face flange has a gasket surface in the same plane as the bolting circle face. Applications using flat face flanges are frequently those in which the mating flange or flanged fitting is made from a casting. Plain flange looks like a flat circular disk with inner bore and bolt holes on .. Stainless plate flanges EN1092-1, type 01, PN25 The Flat Face flange has a gasket surface in the same plane as the bolting circle face. Applications using flat face flanges are frequently those in which the mating flange or flanged fitting is made from a casting. Plain flange looks like a flat circular disk with inner bore and bolt holes on it.It.. Stainless plate flanges EN1092-1, type 01, PN40 The stainless flat flanges PN40 are a product of choice for carrying corrosive or sanitary fluids, slurries and gases, particularly where high pressures, high temperatures or corrosive environments are involved. Due to stainless steel’s aesthetic properties, the plate stainless s..